This planet's odd orbit can be explained by a series of gravitational dominoes that make the planet orbit around its star "backwards." A perplexing alien planet locked in a "backwards" orbit around its parent star may finally be explained by the discovery of an extra planet and star near the oddball planetary system, scientists say. The discovery is centered on the so-called "backwards" planet HAT-P-7b, which orbits a star 1,040 light-years from Earth in the constellation Cygnus. The planet, first spotted in 2008, has long defied explanation because of its orbit, which carries the world around its parent star in the opposite (or retrograde) direction of the star's spin. Now, a Japan-led team of astronomers has found a second star and alien planet near the planet HAT-P-7b and its stellar parent. They used the Subaru Telescope Facility in Hilo, Hawaii, to make the discovery. Long-term gravitational interference from the newfound star and alien planet, which is a Jupiter-size world called HAT-P-7c, may be responsible for the strange retrograde orbit of HAT-P-7b, researchers said. "The current team thinks that the existence of the companion star (HAT-P-7B) and the newly confirmed outer planet (HAT-P-7c) are likely to play an important role in forming and maintaining the retrograde orbit of the inner planet (HAT-P-7b)," officials with the Subaru Telescope Facility explained in a statement today (Jan. 24). The planetary system around the star HAT-P-7 includes a companion star and two planets. These photos of the system were taken by the Subaru Telescope. 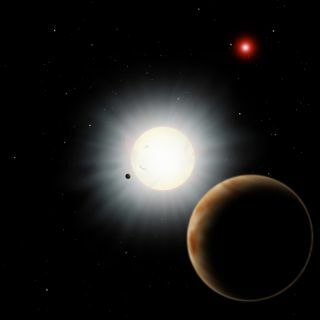 The orbit of the newly discovered planet HAT-P-7c is located between the retrograde HAT-P-7b and the newfound star, the researchers explained. The newly discovered second star pulled the giant outer planet into a tilted orbit until its path started affecting the inner planet, HAT-P-7b, generating the latter's retrograde orbit, they added. This sequence of gravitational dominos could account for the backward journeys of many retrograde extrasolar planets, Subaru observatory officials said. It also clears up a recent study that suggested the backwards planet and its parent star on their own could not explain the oddball orbit setup. That 2012 study, by another researcher, determined that the gravitational push and pull between HAT-P-7b and its central star should prevent the exoplanet from maintaining its counterintuitive orbit. The new study was led by astronomer Norio Narita, Yasuhiro Takahashi, Masayuki Kuzuhara, and Teruyuki Hirano of the National Astronomical Observatory of Japan and the University of Tokyo.